International Journal of Drug Development & Research (ISSN 0975-9344) provides the quarterly publication of articles in all areas related to Anticancer Drug Development, Antidiabetic Drug Development, Drug Development Research, Generic Drug Development, Preclinical Drug Development, Structure Based Drug Design, Phases of Drug Development, Cardiovascular Drug Development, Lead Optimization in Drug Discovery, Formulation Development, Drug Addiction Research, Drug Research and Discovery Process, Industrial Pharmacy, Mass Spectrometry, Chromatography in Drug Development, Veterinary Drug Development, Herbal Drug Development, Biomarkers in Drug Development, Translational Drug Development to meet the general criteria of significance and scientific excellence. Papers will be published approximately one month after acceptance. 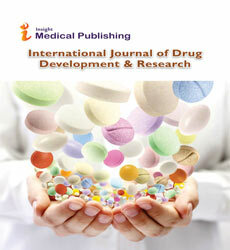 The International Journal of Drug Development & Research is a quarterly publish Journal, which publishes original, research work that contributes significantly to further the scientific knowledge in pharmaceutical sciences. International Journal of Drug Development & Research is a multidisciplinary open access peer-reviewed pharmacy journal, publishes the results of original scientific research and reviews in all fields of Pharmaceutical Sciences. Publishing with open access is not without costs. IJDDR defrays those costs from article-processing charges (APCs) payable by authors once the manuscript has been accepted for publication. IJDDR does not have subscription charges for its research content, believing instead that immediate, world-wide, barrier-free, open access to the full text of research articles is in the best interests of the scientific community. Besides APC, authors also need to pay 219USD as administrative fees after successful acceptance of their article for publication. Case Reports are the critical surveys of any complication performed in any region, area or demography to study and focus the causes and exclusion of complication. IJDDR follows single blind review process to check the authenticity of submitted papers. All Manuscripts submitted to the journal should be immediately sent to the peer-review to the reviewers and a manuscript number should be assign for the future correspondence. After receiving the reviewers report/ comments, the report will be communicated to the authors for possible corrections if any. After correction authors will be directed to submit revised manuscript within the time limit. After the submission of revised manuscript, it will be sent for re-review to the reviewers and the final proof as recommended by reviewers, will be communicated to the authors followed by the publication in respective/upcoming issues. Manuscripts are accepted on the understanding that the authors have obtained the necessary authority for publication. The publisher will presume that the corresponding author has specifically obtained the approval of all other co-authors to submit the article to IJDDR. Submission of an article to IJDDR is understood to imply that it has not been either published or not being considered for publication elsewhere. Manuscripts should be neatly typed, 1.5 lines-spaced throughout, including tables, on pages of uniform size with at least 1.5 cm margins on all sides. On acceptance authors are asked to fill the copyright transfer form that is available on journal’s web site. The text of original articles should be divided into sections with the headings: Title Page Abstract, Key-words, Introduction, Material and Methods, Results, Discussion, or result and discussion, References, all the tables, graphs and figures should be incorporated into the text with appropriate captions. Manuscript Title Page Top of paper, Times New Roman; Fonts all caps, bold, 14 points. Author Names Last name, followed full first name, corresponding author of the manuscript must be marked with an asterisk and should be listed first, font: bold, 12 points. E-mail: email of correspondence authors, 10 points. First page file should contain Manuscript Title, Authors detail, Affiliation, Email, address. Article file should contain Abstract, Introduction, Materials and Methods, Results, Discussion or Results and Discussion, Conclusions, Acknowledgements (if applicable), References; Tables should be appropriately included in the text. Abstract should contain maximum 250 words. Plagiarism is a serious issue around the world in the arena of manuscript writing. No doubt that, plagiarism brings academic dishonesty to the author(s) as well as the journal concern. Plagiarism means "Use or close imitation of the language and thoughts of another author and the representation of them as one's own original work." This has been noticed by the editorial team of IJDDR that, authors are simply copying scientific data and information from the other published papers, which is an awful practice in academic fraternity. Therefore I request to the all our author(s) please adopt the holistic & pragmatic approach to design the manuscript of interest. Hence IJDDR will not be responsible for further action on Plagiarism issue. The author will be solely responsible for plagiarism issue. Erah PO, Goddard AF, Barrett DA, Shaw PN, Spiller RC. Effect of pH on the stability of amoxycillin in buffered aqueous solutions and in gastric juice. Pharm Sci 1995; 1: 597-600. Metthews DE, Farewell VT. Using and Understanding Medical Statistics, ed 3, revised. Basel, Karger, 1996. Goggin P, Northfield T. Helicobacter pylori Infection. Lancaster, England, Klumer Academic Publishers, 1993, pp 18-25. Laizure SC, Evans WE. Clinical Pharmacokinetics. In: Herfindal ET, Gourley DR, Hart LL (eds). Clinical Pharmacy and Therapeutics, ed 5, Baltimore, USA, Williams and Wilkins, 1992, pp 1-19.